Hollywood never made many volcano movies. Heck, I can’t think of any since 1997’s two-pronged attack of Dante’s Peak and Volcano. There must have been some since then, but if so, they stayed under the radar. The genre returns with 2014’s Pompeii. Based loosely on historical events, the movie takes us to 62 AD, where we see Romans slaughter the residents of a Celtic village. Because he fakes his death, young Milo (Dylan Shombing) survives, but the orphan ends up abducted into slavery. Fast-forward to 79 AD, where we meet Milo as an adult (Kit Harington). Forced into labor as a gladiator, he fights his way to the top of his field and winds up in Pompeii, Italy. There Milo meets Princess Cassia (Emily Browning) and romantic sparks fly despite their radical difference in social class. We follow Milo’s career as a gladiator as well as his unlikely relationship with Cassia – and how they react when Mount Vesuvius erupts and threatens all the residents of Pompeii. Spoiler alert? Nah – if you don’t know that eventually the volcano will erupt and destroy Pompeii, you probably felt surprised when the boat sank at the end of Titanic. 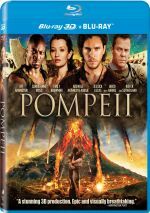 Like that 1997 hit, Pompeii attempts to generate its drama via the drama experienced by its fictional characters. Although we’re aware of the global events, we don’t know what will happen to Milo, Cassia and the movie’s other roles, so Pompeii comes with an ending less predictable than otherwise might be the case. Though I alluded to Dante’s Peak and Volcano at the start, Pompeii really does owe a much greater debt to Titanic - and 2000’s Gladiator shows a substantial influence as well. For better or for worse, Titanic changed the disaster genre forever. Sure, those films previously included prominent character elements, as we needed to care about the participants to some degree if the mayhem delivered an impact. However, most disaster films focused on spectacle over personality; they told us just enough to flesh out the roles and then heaped on the mayhem. Titanic offered an alternate template. Of course, it gave us plenty of commotion and destruction, but it devoted much of its running time to the Jack/Rose relationship – much more than would normally occur within its genre. Love or hate that relationship, Jack and Rose became a major reason that Titanic turned into one of the most successful movies of all-time; without that side of the film, it wouldn’t have been nearly as big. This means that many disaster movies since Titanic come with similar emphasis on characters and relationship – which means someone other than Paul WS Anderson should’ve directed it. Anderson’s 20-year career shows him to be a journeyman filmmaker. His movies often come with pretty good action but they seem undistinguished in other ways and never appear especially memorable. Had Pompeii focused largely on the action side of the equation, it might’ve worked better, but instead it focuses heavily on the personal drama. During the time before the volcano erupts, we get some decent gladiator battles, but the character elements dominate. Unfortunately, they don’t go anywhere. Milo never becomes more than “tough and brooding”, while Cassia stays “lovely and independent”. In the Billy Zane role, Kiefer Sutherland plays a Roman Senator with the hots for Cassia. If only he wore a mustache to twirl, he’d be complete; Sutherland’s campy performance occasionally threatens to bring some life to this gloomy affair, but he stays pretty one-dimensional and forgettable as well. Admittedly, Titanic’s characters remained archetypes as well, but the movie still managed to make them appeal to the audience. That never occurs in Pompeii, as we never invest in the fates of the participants. Despite all the drama on display, the film seems curiously dry; not even slight hints of emotion manage to emerge. If Pompeii spent less time in the build to the eruption, this issue wouldn’t matter too much, but given that it uses about 70 percent of its pre-credits running time on those moments, the end result seems slow and tedious. Even when the volcano blows, nothing much of interest occurs. Again, this comes back to our lack of interest in the characters. When the fireballs fly and the ash falls, we see predictable outcomes without much charge to them. At no point do we threaten to care about the results. Even the last shot falters. Intended to be romantic and touching, the final image instead seems creepy; it doesn’t convey the appropriate pathos at all. On the positive side, Pompeii boasts good visual effects, so the climax looks solid. It also delivers occasional moments of interesting action; derivative they may be, the gladiator scenes boast moderate excitement. Unfortunately, any compelling elements end too quickly and leave us without much to keep us involved. Pompeii simply fails to move the audience, and that becomes its fatal flaw. Pompeii appears in an aspect ratio of approximately 2.40:1 on this Blu-ray Disc. For the most part, the image satisfied. A bit of softness crept into the presentation at times, though not to a substantial degree. I saw the occasional slightly fuzzy shot but not more than that. Those instances didn’t dominate, so the majority of the film appeared accurate and concise. I witnessed no signs of jagged edges or shimmering, and edge enhancement seemed absent. Print flaws also never reared their ugly head, as the movie looked clean at all times. Like most modern action films, Pompeii opted for a stylized palette; here, blues and tans dominated. Within those choices, the hues appeared well-rendered. Blacks seemed dense and firm, while shadows appeared fairly smooth and clear. The image wasn’t flawless, but it seemed solid for the most part. As for the DTS-HD MA 5.1 soundtrack of Pompeii, it worked well, as the movie presented an engaging soundfield. Not surprisingly, its best moments related to the mix of gladiator and volcano scenes. These helped open up the spectrum pretty nicely and added real zing to the proceedings. We got good stereo impressions from the music along with solid environmental material. The latter reverberated in the rear speakers to positive effect, and some unique action material popped up there as well. As one might expect, the climactic volcanic eruption added the most dynamic material and helped involve us in the proceedings. In this two-disc package, we get both the 2D and 3D versions of the film. The picture quality comments above reflect the nature of the 2D edition – does the 3D image add much to the proceedings? To a decent degree, yes, though I don’t think the 3D elements dazzle. As one might expect, the volcanic components do most of the heavy lifting here. Much of the movie opts for general dimensionality, and that side of the image works fine. When the mayhem begins, the 3D becomes a bit more immersive, especially when we get ash and floating debris. None of this turns into a stellar 3D affair, but it gives us reasonable involvement. 3D picture quality also seems good, with strong delineation on display; this was one of the sharpest 3D images I’ve seen. Inevitably, colors and shadow detail take a hit due to the dimness that comes with 3D presentations, but the semi-desaturated palette minimizes the impact on the hues. Low-light shots can be a bit dense – a factor exacerbated by all the dark moments in the climax – but they remain adequate. The 2D image offers stronger clarity, but the 3D version also looks very good. Alongside the film, we find an audio commentary from director Paul WS Anderson and producer Jeremy Bolt. They discuss what led them to the project, story/character areas, history and accuracy, cast and performances, sets and locations, various effects, production design, costumes and music, and a mix of other topics. I don’t love their movies, but Anderson and Bolt consistently record fine commentaries. That trend continues here, as they offer a pretty thorough take on Pompeii. Other than a few lulls, this becomes an informative, peppy chat. 20 Alternate and Deleted Scenes fill a total of 23 minutes, 32 seconds. These tend toward character moments, with an emphasis on Cassia’s father and his business dealings; that becomes the major subplot seen here. We also get a longer look at a local festival. Though these add some background, none of them would make the movie more interesting. A mix of featurettes ensue. The Assembly goes for seven minutes, 14 seconds and offers notes from Anderson and actors Emily Browning, Kit Harington, Kiefer Sutherland, Carrie-Anne Moss, Jared Harris, Jessica Lucas, and Adewale Akinnuoye-Agbaje. The show looks at cast, characters and performances. Nothing fascinating appears here, so expect a pretty forgettable take on the topics. With The Journey, we find a seven-minute, 42-second piece. It features Anderson, Bolt, producer Don Carmody, director of photography Glen MacPherson, and production designer Paul Denham Austerberry. This piece examines attempts at realism, sets, cinematography and production design. Though not the meatiest show, it gives us more substance than "Assembly”, especially when we get close-ups of the sets. Next comes the six-minute, 52-second The Costume Shop. In it, we hear from Moss, Browning, Sutherland, Harington, and costume designer Wendy Partridge. As expected, this one concentrates on outfits. It follows “Journey” to become a quick but insightful piece. For a look at effects, we go to The Volcanic Eruption. The seven-minute, six-second reel provides info from Anderson, visual effects supervisor Dennis Berardi, and special effects coordinator Tony Kenny. We get info about the practical and CG effects used in the film. Expect another useful program. The Gladiators lasts six minutes, 23 seconds and includes Harington, Sutherland, Akinnuoye-Agbaje and stunt coordinator Jean Frenette, “Gladiators” discusses action and stunts. It continues our movie-specific featurettes in a satisfying manner. Finally, Buried in Time goes for 24 minutes, six seconds and gives us comments from Anderson, Bolt, Harington, Sutherland, Moss, Akinnuoye-Agbaje, Browning, Austerberry, Partridge, Kenny, Berardi, MacPherson, University of Cincinnati Professor Steven Ellis, prop master Chris Geggie and actors Currie Graham and Jared Harris. “Time” looks at some of the history behind the project, Anderson’s approach to it, cast, characters and performances, action and fight scenes, production design and costumes, weapons and effects, camerawork and shooting 3D. I hoped “Time” would give us a nice history of the real events in Pompeii, but instead it turns into a basic behind the scenes show. It’s not a very satisfying one, unfortunately, as it’s too general and occasionally repeats info from other featurettes. This isn’t a bad program, but it’s lackluster. The disc opens with ads for That Awkward Moment, The Monuments Men, A Fighting Man and Afflicted. These also appear under Previews along with a promo for Stalingrad. Disc Two provides a 3D clip for Amazing Spider-Man 2 as well. No trailer for Pompeii pops up here. I hoped Pompeii would deliver an exciting historically-based disaster movie. Unfortunately, it sags under the weight of its dull romantic elements and fails to create much to keep the audience interested. The Blu-ray provides strong picture and audio as well as a good mix of bonus materials. While I think this becomes a solid Blu-ray, the movie itself disappoints.